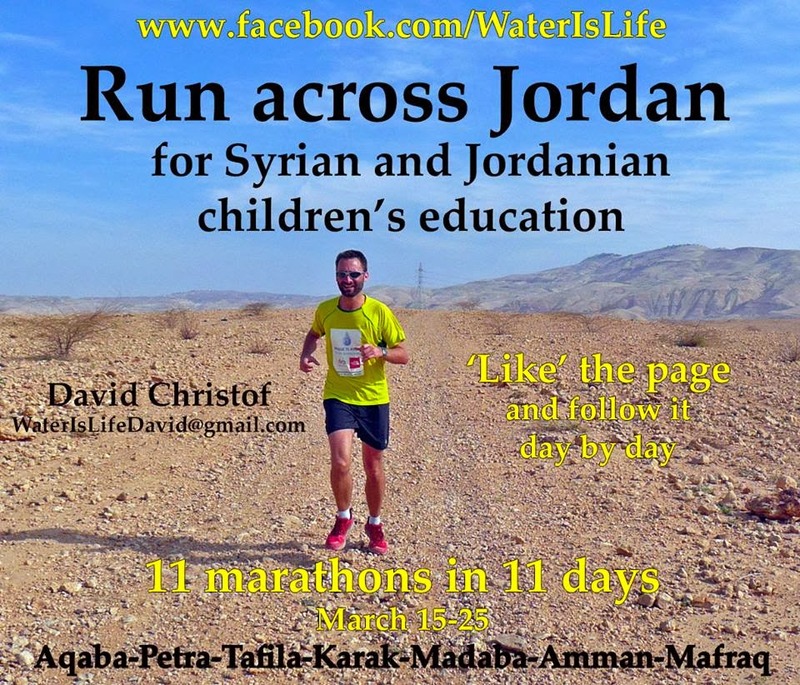 Amman—After his run around the world, David Christof will cross the Kingdom of Jordan in eleven marathons from the 15th to the 25th of March. David hopes to raise money for Jordanian and Syrian children’s educational needs such as school improvements, supplies and equipment. Over a third of all Syrian refugees who have found refuge in the Kingdom are children and Jordan is struggling to meet the needs for teachers, materials and space to provide them with an education. Informal schools run from garages and other ad-hoc locations attempt to provide education to the children who cannot enroll in the Kingdom’s over-crowded schools. “Everyone is aware of the importance of providing children with quality education. It is our responsibility to ensure children are given a better future,” Christof, who ran across 16 countries in a non-stop relay called the Blue Planet Run to raise awareness about the safe drinking water crisis in 2007, said. From Aqaba to Northern Jordan, he will leave after the Dead to Red Relay organized by the Amman Road Runners. Along the route, he hopes people will join him for parts of the journey. Rob Maroni, the Country Director of Mercy Corps, has already signed up for a few hours en-route. David will start his run in Aqaba on March 15 and will continue to Petra/Wadi Musa (March 17), then following the historic King’s Road through Tafila (March 19) and Karak (March 21) to Madaba (March 23). Then he will pass through Amman (March 24) and finish in the Mafraq area on March 25. Every day he will run approximately 42 kilometers. You can follow David’s adventure day by day on his public facebook page www.facebook.com/WaterIsLife . When he passes through Amman, a press conference will be organized at the Czech Embassy in Amman (Abdoun). The event will start at 9:30am on Monday, March 24. Journalists will have an opportunity to ask David questions, as well as a representative from Helping Refugees in Jordan. Following the press conference, there will be a symbolic run with David (open to the general public), after which David will then start his run towards Mafraq. His long track record of running for charities has granted him the support of Mercy Corps Jordan, the Czech Embassy in Amman (which has provided medical care for special cases from Jordan and Syria as well as funding other humanitarian projects in the country) and the volunteer group Helping Refugees in Jordan. The volunteer-based organization provides support to refugees throughout the country and especially to schools by providing them with the needed school supplies and psycho-social activities for the children. Thanks to a great network of volunteers and long-lasting relationships with Jordanian suppliers, the organization is able to provide material aid to refugees at the lowest cost and using second-hand items and donations. “It’s a great opportunity to call for continuous support for all children in Jordan and also to thank the Kingdom for the great generosity it has shown in handling the refugee crisis,” Christof, who has already completed 21 marathons and 13 ultra-marathon races, said. Because of the generous partners of this charity project –The Czech Embassy in Amman, Challenger Team, Škoda Jordan, Amman Road Runners, and The North Face, none of the money raised will be used for the event itself, but instead will go directly to Mercy Corps. “I know that the money I will raise through my run across Jordan will be just a drop in the ocean, but even if I can just help a handful of people, it is better than to help no one…,” Christof said upon his recent visit to the Zaatari camp, an experience that strongly comforted him in his willingness to help out. “What to say… it was heartbreaking seeing so many people misplaced by war”.